One that pays a good premium of course. There's no use in selling a covered call if you're not compensated for your risk. Covered call selling is regarded as a conservative strategy, but the covered call seller is at risk if the underlying stock drops. Therefore, the amount collected from selling the covered call has to be sufficient to compensate the call seller for the risk. What makes a premium a good premium? Consider the following example: It's April 1st and Rambus is trading at 39.35. RMBS options are listed below. Which option generates the best return? The 35 Aug call pays the most money, $10.00, but it's $4.35 in the money. The 40 August call pays 19.32% of the stock price in time premium, but it's 4 months away. Which is the best? The April 35 call returns 4.73% in time premium with a $4.35 downside hedge for less than 1 month. The maximum profit of $1.85 will be retained even if the stock drops to $35. This option has the highest premium. At Optionistics the Covered Call Report identifies the calls that are trading with the highest premiums each day. Here is an explanation of how to read the report. A common covered call strategy is to sell covered calls each month until the stock is called away. When using the Covered Call report the best calls for specific months can be selected. Another option is to select "Any" month, and choose the covered call that pays the highest premium regardless of the expiration. At Optionistics, we identify the highest paying Calls and Puts regardless of strike or time to expiration. If you're considering selling a covered call on a particular stock, it is useful to know when the calls on that stock are paying high premiums. 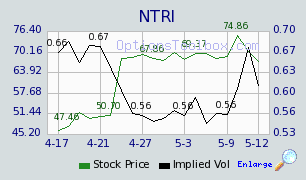 The Expanded Quote chart for NTRI on the left shows the price (green line) and the volatility (black line). Options pay high premiums when the volatility is high. When using the Expanded Quote, the relative expense of puts and calls can be viewed at a glance. Calls were expensive through 4/21, and again on 5/11. Call sellers would have received a significantly higher premium on 5/11 versus 5/10. For example, the at the money June call sold for $7.25 on May 10th. On May 11, the at the money June call sold for $8.40. High paying Covered Puts are also reported.